Note: Bundle will be null in onCreate() method if there is no saved instance state. If the bundle is null then onRestoreInstanceState() is never called. If the user hits the back button or if your program calls finish() then no instance state is saved. The app that was created in the previous chapter restarts the game when the user flips from Portrait to Landscape orientation. 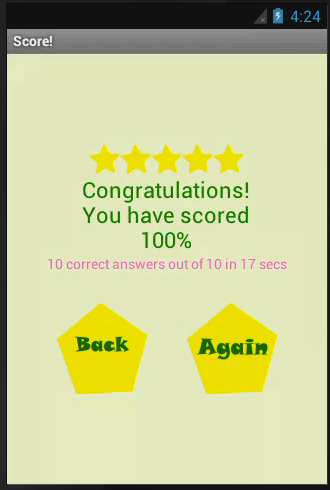 Enhance your Math App to ensure that the game state ( total correct answers, total cards and time elapsed) is saved when the user flips the phone from Portrait to Landscape and vice-versa. Explicit Intent: If you specify the target component in your intent, Android has no doubt where the intent is supposed to be routed to – it will launch the named activity. This routing approach is referred to as explicit routing. In the above example we intend to invoke the SecondActivity.class explicitly. This is an example of Explicit Intent. Implicit Intent: If you do not specify the target component, then Android has to find out what components are registered to receive the intent. This routing approach is referred to as implicit routing. Implicit intents let Android choose the class or application component that best satisfies the user&apos;s request and preferences. When you invoke one application from another it is mostly Implicit intent which is used as applications written by companies/programmers will not know the exact Activity name that needs to be invoked on a program written by someone else. The two most important pieces of an Implicit intent are the ‘Action’ and the ‘data’. In the above example any Activity which has registered itself with Action ‘ACTION_VIEW’ and which supports Data of type CONTENT_URI will be selected by the system and presented to the requesting program. How a component registers itself with specific criteria is detailed in Intent Filters below. Contact List application which are available in all devices has registered itself for the criteria shown in the example so when you invoke with the above example code, Contact List application opens up. If more than one component satisfies the Intent, a list of choices will display, allowing the user to decide how best to handle the request. For example, if the data is an image, the list might include the Gallery and Camera applications. Actions are constants, such as ACTION_VIEW (to bring up a viewer for the resource), ACTION_EDIT (to edit the resource), or ACTION_PICK (to choose an available item given a Uri representing a collection, such as content://contacts/people). ACTION_VIEW content://contacts/people/1 -- Display information about the person whose identifier is "1". ACTION_DIAL content://contacts/people/1 -- Display the phone dialer with the telephone number of the person with identifier ‘1’. The activity must support the specified action. The activity must support all of the categories named in the intent. So you want to make your intents specific enough to find the right receiver(s). Stating Your Intent(ions): All Android components that wish to be notified via intents must declare intent filters, so Android knows which intents should go to that component. To do this, you need to add intent-filter elements to your AndroidManifest.xml file. category: Main activity will be in the LAUNCHER category. Others would be DEFAULT or ALTERNATIVE categories. extras: Along with Action and Data, an Intent can also use "Extra" information. The Intent Extras property is a Bundle type, a collection of objects to be passed between processes. The Intent putExtra() has numerous overloads that let you place any number of types into the bundle before starting the activity. In the called activity, the string that is set can be retrieved with the method this.getIntent().getStringExtra(“finalScore”) and you use getIntExtra(“totalTime”) to get the integer value. Simple approach to start another activity is to create an Intent and call startActivity method by passing the created Intent in it. Failing to include the tag will cause the application to fail when you attempt to start the activity. Look into the LogCat View to see that the exception being thrown is ‘ActivityNotFoundException...’ The LogCat tool can be found from the AndroidStudio by clicking on the Android tab in the bottom. Note there is no Intent-filter declaration in the above example, hence this activity can be invoked by Explicit Intent only. To make this activity be found through an Implicit Intent, Intent-filter declaration as shown below is required. Now SecondActivity will get selected whenever an Intent is created with the Action and/or Data as specified in the Intent-filter matches. So far you learnt how to call another activity or application using intents. In the previous examples, the request to invoke another application or activity was from the caller activity to the called activity. But there is no way the called activity can communicate back to the caller activity with any information. To get this feature of returning information back to the caller activity, invoke the other activity using startActivityForResult() method and then implement onActivityResult() method in the caller activity. Similar to startActivity() method, pass the Intent object as the first parameter. The second parameter is a requestCode which is any identifier to indicate the caller activity. The onActivityResult() method passes an integer requestCode as the second parameter of startActivityForResult(). The resultCode is an integer used in the called activity, that maps to the Activity constant RESULT_OK by default but can be set to any value. Once you&apos;ve checked that the activity did not fail and that the activity was called with a particular requestCode, you can process the activity&apos;s results. You can call the getExtras() method of the Intent passed to this event handler to get the results. Please note bundle will have values only if it was set with values in the setResult method of the called Activity. Notice when the Toast in the caller activity is displayed when the called activity is invoked and returns a message through setResult method back to the caller activity. If more than one component satisfies the Intent, a list of choices will display, allowing the user to decide how best to handle the data. For example, if the Data is removed then more applications satisfy the specified Intent. Connecting to the internet also requires you to add the android.permission.INTERNET permission to the manifest.